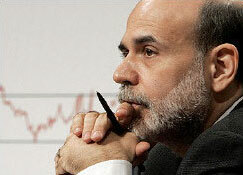 The Fed chairman Ben Bernanke said Tuesday that the worst recession since the great depression is probably over. In responding to questions at the Brookings Institution, where he gave a speech marking the first anniversary of the market crisis, Mr. Bernanke said “The recession is very likely over at this point.” The Fed boss also said that the economy is probably growing now, but cautioned a recovery will be moderate at best and that it would be many months before we see a significant drop in unemployment rates. During his speech at Brookings, which was identical to the one Mr. Bernanke delivered last month at Jackson Hole, the Fed chief repeated his broad defense of the extraordinary rescue efforts by the central bank over the last year. Bernanke during his speech also touched on the subject of the “shadow banking system,” which allows banks to package loans into securities. He said the system will likely be smaller and simpler when the current crisis eases. Could We Have Had a Severe Recession Without the 2008 Financial Crisis? Is The US Already in Recession? I applaud Mr. Bernanke for these comments. That applause is due whether he honestly believes what he’s saying or not. By Bernanke making these comments I think that it will at least ease people’s fears and possibly encourage optimism. That alone could help contribute to our climb out of the recession. I think a whole lot of what determines how long the recession lasts, is people’s attitudes to it. Its a simple fact that we need people to be out spending money to stimulate our economy. People that feel that the recession is going to go on forever are not going to be saving any money they may have, their going to hoard it which will not contribute to our recovery in anyway.